For readers who are unfamiliar with this kind of art, I’d like to give context and background. Hopefully you will finish this series with a better sense of the skill and effort creating an image like Amalie requires. For those beginning to explore the possibilities of creating images of stuff that’s not real, I hope this series will serve as a note of encouragement and solidarity. Hopefully exposing some of the “mess” of the creation process will show that what I do isn’t so different from what you’re doing — learning new techniques and expanding our skill sets. Finally, for those who have mastered the art of computer generated imagery, I hope this series will offer you a chance to share your hard-earned wisdom and “tricks of the trade”. Maybe you’ll even pick up a pointer or two. Now What Exactly Is It You’re Doing? I get asked this question a lot, and it’s a difficult question to answer. Unlike other forms of art production there’s no quick and easy verb to describe this process. Technically what I do is computer generated imagery, or CGI. I am personally not fond of that term as I’ve found it leads people to believe that the computer completely creates the image. Instead of seeing the computer as a tool (like paint, clay, or a camera) the assumption is that the artist simply clicks a button and the program proceeds to “make the art”. If such a program exists, I haven’t found it. Instead, photography provides a pretty good analogy. Like a photographer I have to frame my shot, choosing specifically what I wish to include as well as what I wish to leave out. I have to consider the use of negative space, or headroom, and consider how the visual lines of objects within the shot will interact with the edges of the frame itself. An empty workspace. The wire frame cube is the base of the workspace, and acts as a grid of reference. Click on this image to see a larger version. However, a photographer can simply take a camera and look around for a subject; as a digital artist I have to create the environment to take the photo. For example, to the left is a screenshot of my starting workspace. It’s very empty! As the artist, it’s up to me to create everything in this space so that I can then take a virtual photo of these things that don’t exist. As you might imagine, this makes things both easier and harder. On the one hand, I have complete freedom. Anything that I can imagine and create in this space is potential image fodder. A photographer* is limited to the realm of the physically possible. On the other hand, because of this I must be hyper aware of details. For example, consider a simple reflection. Suppose I compose a picture of a hallway intersection with a mirror on one of the walls. As a photographer, I don’t have to worry about the mirror; whatever lies around the corner will show up in the mirror. In the workspace on my computer, however, there may not be anything around the corner; when I prepare the final image the mirror may inadvertently reveal the line where the world ends! 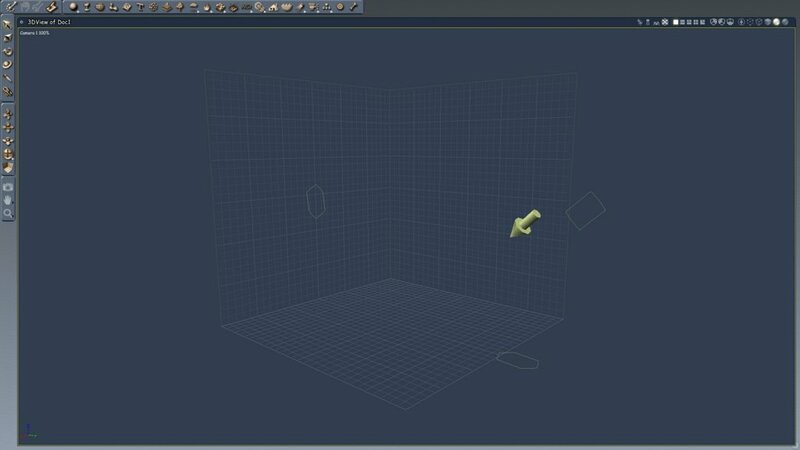 Therefore much of what I will be doing to start with will be establishing the basics of a scene. Right now I’m thinking I will do a tropical beach. I’m not worried about having all the details worked out yet; as I go I’ll figure out exactly what my image subject will be. In our next session, we’ll dive into building a beach and ocean. If you have any questions or comments so far, please feel free to ask in the comments section below! * Disregarding, of course, the use of Photoshop or other methods of image editing. Funny, this was actually something I wanted to ask you to talk about since most people I think are not familiar with this …. Speaking as a graphic designer too! Which doesn’t mean anything. I would love to see more screen shots of the work in “progress”. Like what it looks like at hour 2, and then after 10 hours … etc. I think understanding what this is makes us viewers all the more appreciative! Thanks, Anne! One of the things I’ll be doing is taking screenshots as I go, so I can explain what I’m doing and why. I’ll also try to show what the finished image would look like if I stopped at that point.